iGadget allows you to realize the full potential of your iPod. With iGadget, you’ll be able to transform your iPod into much more than a simple music player. You’ll have the ability to turn your iPod into an information repository. You’ll be able to transfer all kinds of data to your iPod, including driving directions, contacts, appointments, email, notes, tasks, podcasts, RSS news feeds, weather forecasts, daily horoscopes, movie showtimes, gas prices and more! You will have the tools necessary to copy songs off your iPod and back onto your computer. 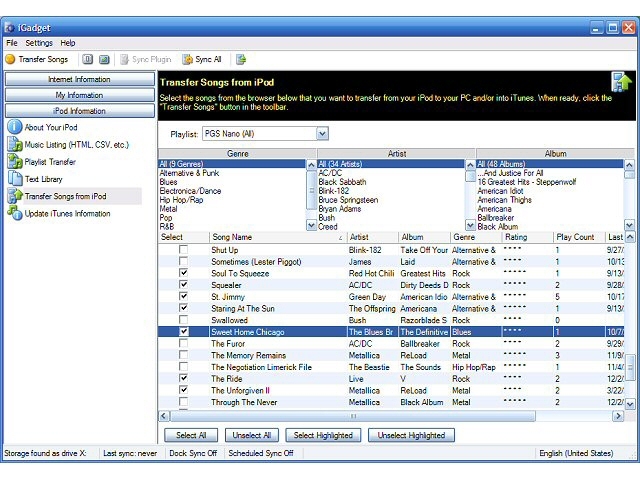 This is very handy in the event of a harddrive crash or when buying a new computer and you’ve discovered that you no longer have all your songs on your computer any more. There is normally no easy easy way to copy songs off the iPod. With iGadget, you’ll have the ability to do all this and more.